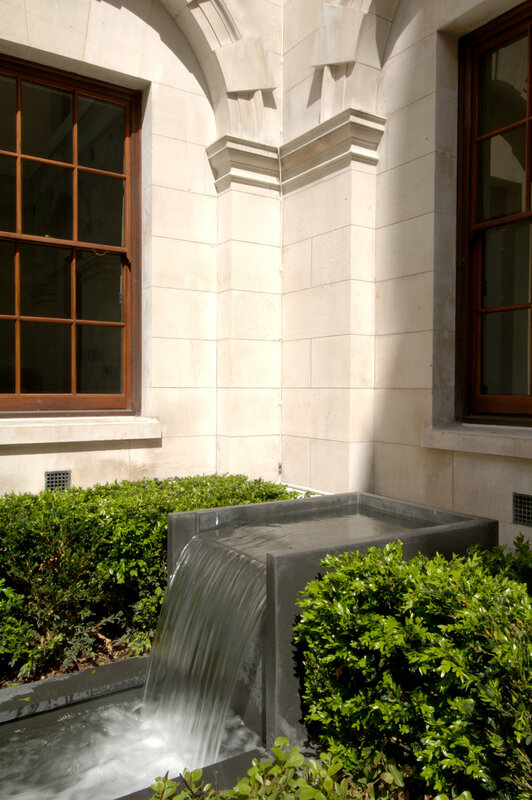 As part of a total refurbishment of HM Treasury by Foster + Partners, Gustafson Porter + Bowman’s brief for the East and West Courtyards was to create a pleasant space with a simplified layout that would serve as a place for small working groups, large events and a peaceful space for contemplation. Our landscape design transforms two lightwells into lush gardens which are organised to support the main east-west axis of the new masterplan. The subtly-undulating landscape form of the West Courtyard creates planted areas around a still, reflecting pool at its centre, which is divided by a gently arching pedestrian bridge. The pool, which can be drained to generate space for events, creates a focus to the space and its reflective surface draws light into the centre. Hard materials used include slate, timber and stainless steel which are offset by shade tolerant perennial planting beds and mature trees. Surrounding the pool on three sides are shade-loving species including a fern garden planted with white flowering bulbs, and Magnolias, Cornus, and Liriodendron trees. The fourth quadrant, paved in slate, provides a bench below a Gingko tree where staff can take advantage of the view and the dappled afternoon sunlight. 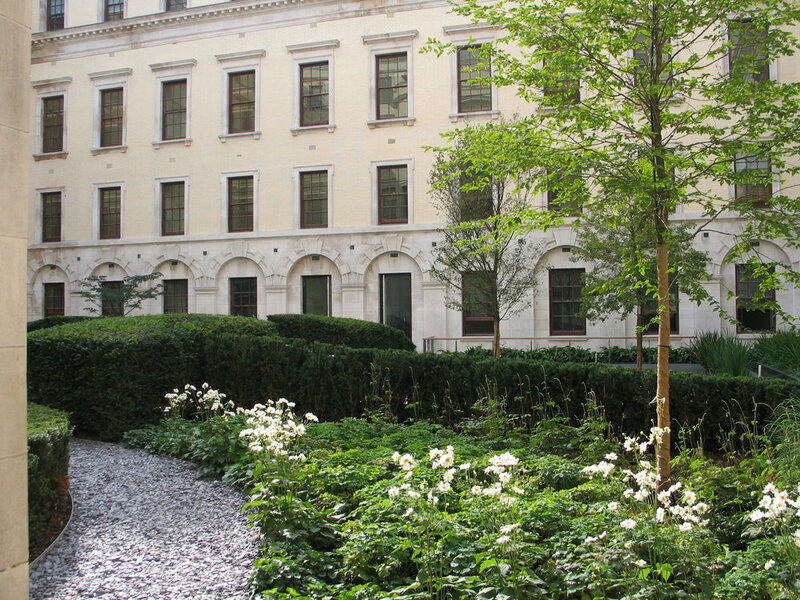 Located over the top of the Cabinet War Rooms, the West Courtyard presented challenges in developing the ground plane to incorporate tree pits and drainage to create a mature landscape. In collaboration with Foster + Partners, we developed the ground slabs to enable sufficient planting depths for mature trees that were craned into place over the top of the buildings. Drainage, pump rooms and water treatment for the main water feature were fully integrated and coordinated with the ground slabs. Since its completion the West Courtyard is a popular gathering space for Whitehall staff and regularly appears in photography of high-profile Treasury staff greeting visitors from overseas. Gustafson Porter + Bowman’s design for the East Courtyard uses the same palette of materials as the West Courtyard, but aims to create smaller and more intimate garden spaces which offer the potential for an outdoor gathering area for larger groups and quieter spaces for individual reflection. The inspiration for the creation of the individual gardens is a contemporary interpretation of the classical parterre, a typical feature of garden design in Northern Europe. Clipped hedges are used to frame the principal route and enclose the more private garden spaces with integrated timber benches for informal meetings, reading or quiet contemplation. The heights of the hedges have been sculpted in a manner to restrict and reveal views of the different garden spaces. A water rill runs the full length of three sides of the courtyard providing a gently splashing sound where the water enters and exits the courtyard. The gentle ripple of this shallow water reflects the sky and surrounding plants. Ornamental plants and trees which thrive in a shaded environment have been chosen for their colour, leaf shape and interesting bark so that a subtle change in the character of the courtyard can be noted with the changing seasons.